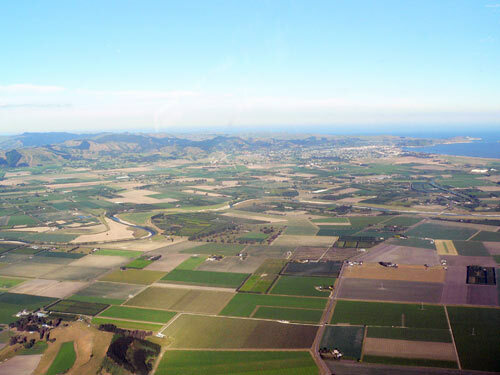 The extent of the Poverty Bay flats, the principal alluvial plain in the region, is shown in this picture, which looks from the vicinity of Ormond south-east towards the city of Gisborne and Poverty Bay itself – both can be seen in the distance. The Waipāoa River, which has created the flood plain, can be seen in the middle left of the view. The even and low elevation makes the whole plain vulnerable to flooding.